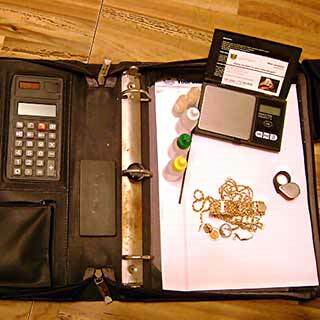 When you call, you will speak with Mike and arrange for a convenient date, time, and location to sell your gold. Usually clients prefer to meet at a fast food restaurant like McDonalds or Dunkin Donuts because these are well lit, safe, public places. You choose the best place near your home or work, and Mike will drive to you! When you meet with Mike, he will sit down and open his test kit. Inside he has a scale, a stone to scratch the items against, and several different acids to verify the purity of the items.